Nicaragua is the largest country in Central America. In the last century, it has suffered a lot of political unrest and a terrible civil war. On top of that, there have been a few earthquakes that have ravaged areas of the country. Even though internal strife has ended the country remains one of the least visited by travelers in the region. But word of its beauty has spread, not to mention the amount of sun that it gets. It's started to become a destination for nature lovers; some even decide to stay and settle down, buying property. Its huge lake, colonial cities, lush forests, stunning beaches, and biodiversity definitely make it a place every adventurer should stop by while traveling along Latin America. Plus, because it is still relatively unknown for tourists prices are still not as high as they would be in more popular places such as Costa Rica. If you are planning a visit to Nicaragua you should learn about its currency in advance. Here are a few facts about it and information about average costs. The Nicaragua Córdoba (NIO): One unit of Nicaraguan currency is called the córdoba. The Nicaragua córdoba is divided into 100 centavos. 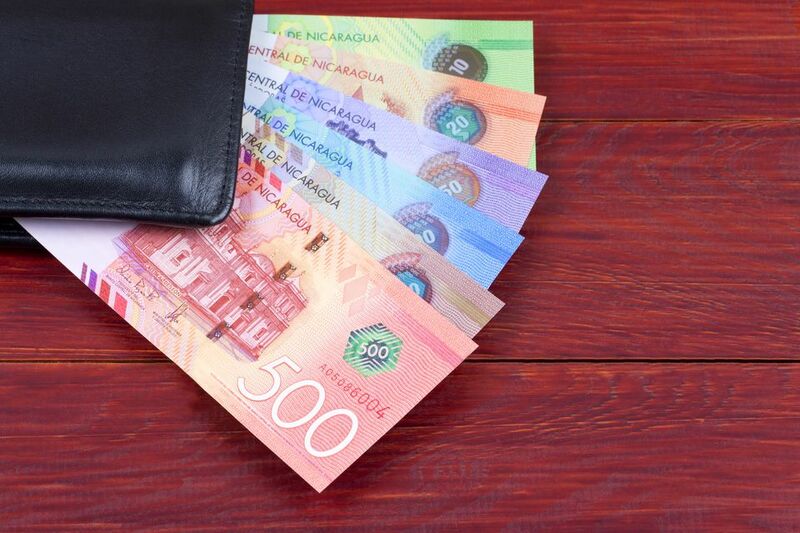 The bills come in six different amounts: C$10 (green) C$20 (orange) C$50 (purple) C$100 (blue) C$200 (brown) C$500 (red). You will also find coins that are worth: C$0.10 C$0.25 C$0.50 C$1 C$5. The exchange rate of the Nicaragua córdoba to the US dollar is usually around C$30 to one USD, which means one córdoba is usually worth around USD 3.5 cents. For up to date exchange rates, visit Yahoo! Finance. The Nicaragua córdoba is named after the founder of Nicaragua, Francisco Hernández de Córdoba. Initially, it was equal to the US dollar. It first appeared in 1912. The original coins used to contain gold. The devaluation of the currency that resulted from the civil war was finally somewhat controlled in 1991. Since then it has been somewhat stable. The US dollar is widely accepted in Nicaragua's most touristy locations but you will be able to get more discounts at stores, restaurants and even in some hotels if you use the Cordoba. Haggling is also almost impossible if you pay with dollars. Small businesses don't like having to go through the trouble of having to go to the bank and do the long lines to change the dollars. At hotels – Hostels typically charge an average of $17 USD per night for a double room. Dorm rooms are about $5-12 USD. The local “hospedajes” (small family run hotels) cost from $19 to $24 USD per night. Buying Food – If you are looking for a cheap traditional meal you can tons of street stalls from where it’s possible to get a full meal for less than $2 USD. However sit down restaurants in Nicaragua also tend to be quite cheap, offering food between $3-5 USD per dish, some even include a glass of a natural refreshment. Western food such as burgers, salads, or pizza can also be easily found at prices that are usually around $6.50-10 USD per dish. Transportation – If you are planning to stay within the city you might want to take the bus. They are efficient and extremely inexpensive at just $0.20 USD. Taxis usually cost around $0.75-1.75 USD per person for a short trip. If you are taking buses from one city to the other you might have to pay around $2.75 USD. Express buses tend to be about 30% more expensive than ordinary buses.